The medieval watch tower that used to dominate the ancient piazza of Vittoriosa. Right: The watch tower in ruins, with the Great Siege Monument in the foreground. Andrea Palladio’s famous ‘Loggia’ in Vicenza, which buttresses an unstable ancient building behind it, with the Torre di Piazza in the background. Right: The impressive church close which opens up into the piazza, burial ground of the fallen of the Great Siege. 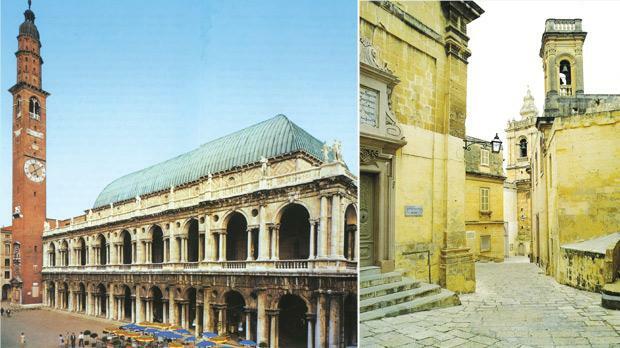 The architectural regeneration of Valletta’s City Gate and its environs has rekindled great interest in the Three Cities. Many hope the haphazard and insensitive reconstruction carried out in the immediate post-war period, particularly in its historic cores, may be revised, re­design­ed, and tastefully recon­structed in keeping with the original congenial context. This would put Valletta on par with other European capitals, which rose Phoenix-like from their wartime ashes, such as Dresden. For the benefit of the cocooned generations, who subscribe to the common prejudice that the past was preferable to the present, a very light dose of recent history about what the people of Cottonera had to endure in their childhood, blighted by a savage war, would not do them any harm. The extent of devastation and utter desolation in Cottonera while World War II was drawing to an end was bewildering and catastrophic. This eerie wasteland, meticulously depicted by a member of the British commission set up by the Governor in 1944, conveys an apocalyptic scenario beyond redemption. “This famous town, long ago stormed for four months by the might of Islam, has now suffered a siege which has laid it once more in ruins. “The Castle of St Angelo, citadel of the defence, yet stands, battered but still the residence of its captain. Southwards from it stretches a ruin-field, unsurpassed for desolation in all Malta. “Churches, houses, even the streets have disappeared; it is impossible to discover the whereabouts of known monuments or make exploration for new discoveries.” (Works of Art in Malta: Losses and Survivals in the War, HMSO, 1948). Later, when the dust of war had not yet settled, the different viewpoints expressed for post-war reconstruction of the harbour area make interesting reading. For instance, the Malta Chamber of Commerce, through its secretary V. Chapelle, submitted various points to the government, basing its recommendations mainly on harbour development particularly “the construction of new quays where steamers both of light and deep draft can moor alongside. “The harbours, also offer a unique centre for trans-shipment to Mediterranean ports.” (Times of Malta, October 10, 1942). It was indeed quite a surprise for me to discover, in preparing this feature, that immediately after the announcement of “a free gift to Malta of ten million pounds” for post-war reconstruction (Times of Malta, November 18, 1942), a certain Lieutenant Clarke suggested in the London Daily Telegraph that “one of the armistice terms should be that the restoration of the destroyed buildings in Malta should be done by Italy with Italian labour and material”. In this recommendation one perceives a subtle hint relating to the enviable reputation of the Italians for their expertise in the meticulous and sensitive reconstruction of historical buildings as evidenced in the spectacular rebuilding of the old Grand Masters’ Palace in Rhodes in the mid-1930s. 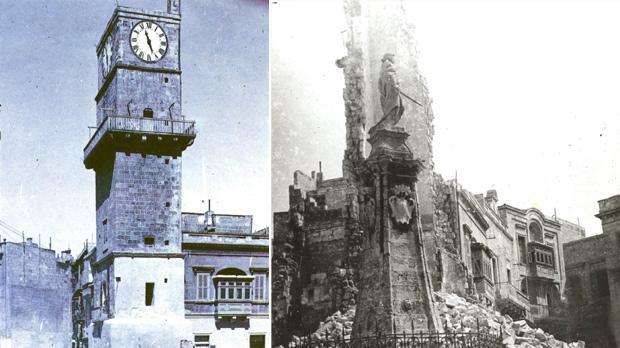 On the local front, Robert Galea in December 1943 broadcast a talk on the work of the committee appointed to study the problem of reconstruction of Malta’s damaged cities, followed up by various lectures on the same topic at the British Council in Valletta. Premonitions of possible repercussions in disastrous reconstruction continued to reverberate in various academic circles as if the sword of Damocles was hanging warily over the Three Cities. The post-war reconstruction in Cottonera, particularly in the medieval city of Vittoriosa, was debated on several occasions in the Council of Government, and various suggestions were made. That expert advice was not long in coming as reports in the British press announced a few weeks later that Austin Harrison had been appointed town planning consultant for the government with Mr Hubbard as his assistant. The massive workload entrusted to Harrison and Hubbard has along the years remained under scrutiny and their detailed report still reverberates among Vittoriosa’s cultural circles and academics hankering for past architectural glory, particularly in the wake of the present Valletta regeneration. In spite of war destruction and cultural losses, Vittoriosa still retains the expression of quality in its extant architectural environment which so impressed Josep Anton Acebillo, responsible for the regeneration of Barcelona, who was recently in Malta as guest of the Malta Chamber of Architects. For even today, the casual visitor is impressed by the magnificent three-gate entrance to Vittoriosa, the most eloquent baroque expression south of Rome, attesting to its European ethos, also the embodiment of our national identity. This walled city, surrounded by a deep dry ditch stretching from Dockyard Creek (formerly Porto delle Galere) to Kalkara Creek, with its lofty cavaliers of St John and St James guarding the land-front, and the historic Castrum Maris (Fort St Angelo) at the other end of the peninsula, still boasts of its Collachio with its authentic medieval character, further enhanced by 13th century Siculo-Norman buildings. In this historic milieu you walk past the imposing original Holy Infirmary of the Order, the ancient auberges which have welcomed the greatest European engineers like Bartolomeo Genga, the Old Armoury, the unique Inquisitor’s Palace and the historic Church of St Lawrence, the former Conventual Church of the Order of St John. The Marina Grande, with its National Maritime Museum and magnificent palaces designed by Vittoriosa-born Lorenzo Gafà, now tastefully and aesthetically restor­ed, add glamour and lustre to this proud compact city which still holds such unique treasures, all within walking distance. It is indeed amazing how this small enclave of European sophistication could at one time in history house three great institutions with strong international connections – the Order of St John, the Papal Legate in the person of the Inquisitor, and the bishop with his ostentatious palace and retinue. Regrettably, the hub, the nerve-centre of this old vibrant city endowed with such inestimable cornucopia, namely its medieval piazza, remains in a state of flux with no definite plan for its regeneration. The present state of this ‘hallowed ground’ is a constant embarrassment. It is a well-known fact that the insensitivity of the post-war town planners and indiscriminate demolition have somehow transformed and obliterated the aesthetic, elegance and medieval characteristics of the Vittoriosa piazza. Only one outstanding 19th century palace, probably designed by Giuseppe Bonavia, has survived the brutal bombing, namely the seat of the St Lawrence Band Club, whose façade, despite its Venetian idiom, is an eloquent expression of Maltese architecture and craftsmanship at its best. Most of the surrounding buildings are so divorced from the elegance and freshness of this façade. Now that the regeneration of Valletta is gaining ground, this iconic zone calls for immediate restoration to its former glory compatible with its status when La Piazza della Torre was the most famous in Christendom as indicated in the siege-maps of the Great Siege of 1565 published in various European cities. The main piazza of Vittoriosa is not so much a city square as a state of mind articulating throughout the centuries the most outstanding events in the chequered history of this ancient town. As a quality city it deserves the rebuilding of the medieval watch tower, capriciously demolished after the war. For centuries it had dominated the city square and its surroundings as the majestic frescoes by Matteo Perez d’Aleccio at the Palace in Valletta confirm. It was always the focal point for all the streets that radiate from the inter-linked piazzettas like the beautiful church close which opens up into the city square, the burial ground for the fallen of the Great Siege, whose monument erected by the Knights and the local populace still stands. Most of the haphazard, colourless, unaesthetic buildings in Vittoriosa’s historic square erected in the rush for post-war social housing offer the possibility of subtle restoration in line with the extant ‘Venetian palazzo’ bringing out the skills of the Maltese architects, master masons, scalpellini and the malleability of local stone. What was accomplished in the post-war period in other devastated European cities can and should be done in Vittoriosa, once the epitome of a united Europe. Although it may be presumptuous of me as a layman to even proffer advice for the regeneration of this city square, I venture to humbly relate my recent exuberant experience in the charming city of Vicenza, the town made famous in the 16th century by the architect Andrea Palladio. whose works in nearby Venice so enriched its architecture. While strolling along in Vicenza I could easily conclude that the most important building in this city was undoubtedly the basilica, Palladio’s first major work and now the symbol of this elegant city. The main challenge Palladio had to encounter in the process was to support by buttressing the existing 15th century unstable Gothic buildings which had to be included in the scheme. This he accomplished with a façade incorporating a double loggia of exquisite proportions. Even as a layman I could not help noticing furtively that each arch is supported by a massive square pillar flanked by two semi-columns and two further small columns resulting in a functional loggia which has made this piazza with its lofty Torre di Piazza and Torre del Tormento one of the most famous in Europe. Call me a visionary and a dreamer or an ignoramus, but in my mind’s eye I visualise Vittoriosa’s iconic piazza enhanced with a similar façade running at the back of a rebuilt medieval watch-tower complementing the beautiful architectural motif of the proud palazzo, the premises of the St Lawrence Band Club. Such a bold undertaking in consultation with renowned architects the likes of Renzo Piano and Josep Acebillo would be the crowning glory of Vittoriosa, showcasing its undisputed cultural traditions that gave Malta its native architectural idiom, namely the Melitan moulding as well as the first auberges and massive fortifications later replicated in the new city of Valletta. Hopefully this rich cultural and architectural connection with our capital city across the water and the acknowledged fact that majestic Valletta owes its very existence to humble Vittoriosa, will receive due recognition when Valletta is crowned European Capital of Culture in 2018.